To begin, go ahead and go to the "buildamodule" resource folder and in that folder go ahead and copy the "assets" folder. Go ahead and go to the base directory for your Drupal site and in the "sites, all, modules, custom" directory, go ahead and paste the "assets" folder. Go ahead and expand it. Go ahead and expand the "steps" folder as well. See there's a number of steps and we'll start from the beginning and just sort of build our way up to the image gallery. Go ahead and open up the "assets dot module" file, which should be empty. And also open up the first step which is called "simple-unmanaged-form dot step". Go ahead and copy the entire code in this file and paste it into your "assets dot module" file and save it. Let me just take a minute to explain why we're building the module that we are. 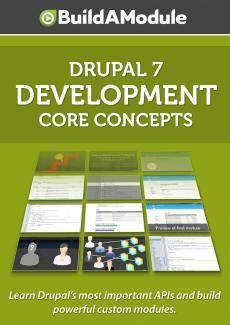 First of all there's two different types of files in Drupal, managed and unmanaged files. Managed files contain a physical location where the file is but they also have a database entry. And modules can register a file in the database and they can also register usage of a file. What that means is that one module can register a file and then another module can register usage of that file so that when the original module attempts to delete that file, it will remain in the database and the physical file will remain until that second module withdraws it's usage of that file. So there's several benefits of using the managed file system and most of the file API is centered around that. We'll talk about some of those benefits as we go through this module. Unmanaged files on the other hand, contain a physical location but they don't have a database entry. So a lot of the management of those files is manual. There's not any saved data about the file unless your module takes care of saving that data. What we're going to do is these first steps is to build a form that will allow us to save an unmanaged file and then we'll go through the steps of viewing those files and managing those files and then we'll rebuild the module to use managed files so you can see the benefits of using managed files and the differences of using each technique. Ok. Let's go ahead and work through the code in here line by line.